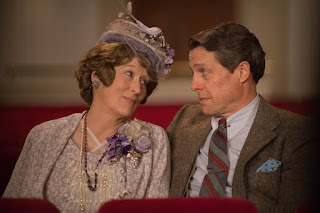 A classy comedy, Florence Foster Jenkins celebrates an elderly eccentric socialite who loved to perform, and her loving husband who perpetuated the myth that Florence could actually sing just to keep her happy. It's New York in 1944. Florence Foster Jenkins (Meryl Streep) is an aging rich patrician, a supporter of the arts and a really terrible singer. Her husband St. Clair Bayfield (Hugh Grant), a failed actor, does all he can to support her passion for singing and performing, including hiring a well-respected vocal coach to work with her for an hour a day. Bayfield also hires young pianist Cosmé McMoon (Simon Helberg) as Florence's regular accompanist. McMoon is horrified when her first hears how truly awful Florence is at singing, but he persists. Bayfield genuinely loves Florence and keeps her happy by arranging small recitals, carefully selecting audience members, paying small newspaper critics to write gushing reviews, and shutting out any non-fans. Florence suffers from a serious long-term illness, and as a result Bayfield maintains a double life, including a separate apartment and a side relationship with Kathleen (Rebecca Ferguson). When a limited-release record of Florence's awful singing unexpectedly becomes a hit among enlisted men, Bayfield and McMoon suddenly have a problem: Florence wants to perform on a big stage, where controlling the audience and the critics will not be easy. 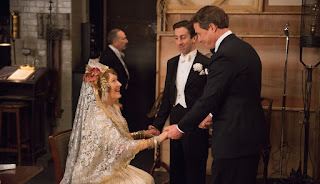 Directed by Stephen Frears and based on real events, Florence Foster Jenkins is an elegant festival of laughs with a lot to say about the value of individualism, dedication and love. With three terrific performances from Streep, Grant and Helberg, Frears keeps the laughs coming while adding layers of character depth and finding unexpected emotions related to defining happiness on unique terms. At its most basic level Florence Foster Jenkins works as a laugh-out-loud comedy. Florence's singing is godawful in the most ridiculous way, and she is oblivious to her limitations. Through the eyes of McMoon, Frears exposes Florence's all-in dedication to her craft, as well as Bayfield's loyal support. In their case wealth can buy fanciful self-deceit, and Florence powers through her lack of ability to great comic effect. But Frears and screenwriter Nicholas Martin also quickly delve into the essence of the lead characters. Florence is a survivor of a tragic early-life medical mishap, and has lived well past her expected expiry date. She is a genuine supporter of the arts and the war effort. And at the heart of her story is true love and affection from Bayfield, a man who has decided to help create an unlikely cocoon of bliss for his soulmate. 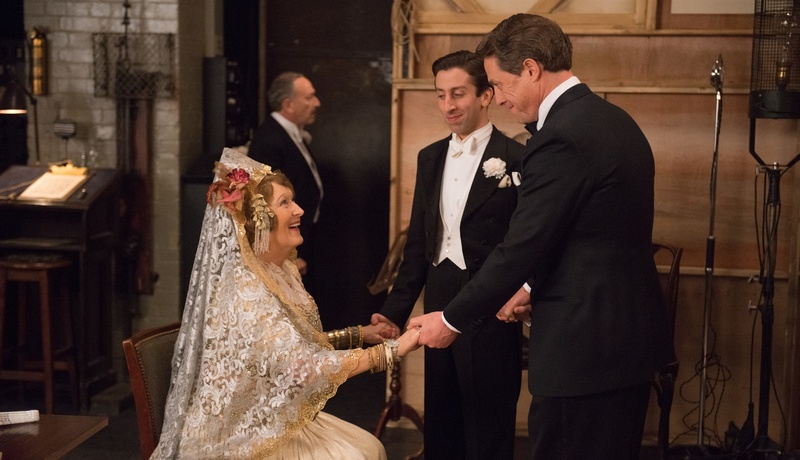 Despite being a small story about relatively privileged individuals, Florence Foster Jenkins rises above its humble limitations to explore the universal search for self-defined contentment. The unstoppable Meryl Streep delivers another perfect performance, mixing pathos with deluded resolve. But Hugh Grant is a revelation, finally evolving into an understated level of maturity. His boyish rascalism scrubbed-off by age, Grant is the heart of the film, allowing Bayfield to skillfully balance multiple agendas, responsible for an elaborate charade, looking after his own needs while keeping Kathleen in balance and McMoon on-board. And as the third point in the triangle Simon Helberg acts as the audience's entry point into Florence's world, and excels as the talented pianist who really could do without a tone deaf singer on his resume. Filled with the lavish costumes of the 1940s upper crust as well as their kookiness and foibles, Florence Foster Jenkins is a sparkling comedy with plenty of heart and soul.